So we are supposed to believe that poor Lord Holmwood, having inherited his dad's syphilis along with his estate, decides to recruit a bunch of Satanic loons in black mitres to 'cleanse his blood'. Said loons tell clap-ridden lord to bring their beloved Count to England. Lord Holmwood does not seem to have inquired into the precise method whereby the medical miracle is to be performed. Give me a break. And then we get the Buffy stuff, with Drac lifting up his lordship by the throat, one handed, and slamming him against his bookshelves. And I gave up because it wasn't going to get any better. It's not as if it was particularly well played. What is it about modern actors? They are totally incapable of conveying a true to sense of period - the effect is of modern people dressed up. At some points the dialogue also smacked of the dressing up box, with unmistakeably modern phrases and rhythms of speech. Oh dear, oh dear. 'Andie' by Adam Golaski - a man on a US internal flight is snow-bound and dances himself dizzy in bizarre masquerade. 'Nostalgia, Death & Melancholy' by Peter Bell - on the Isle of Man, a quest for artistic rarities becomes very strange indeed. 'Numina' by Tony Lovell - you know those little roadside shrines...? 'Going Back' by D. Siddall - you really can go home again, but you shouldn't. 'Ramoth-Gilead' by Mark Nicholls - superb variant on a classic theme. 'The Sea Change' by Helen Grant - diving onto an ancient shipwreck is spooky enough in itself, but that's just the start. Plus reviews, quizzes, and the winner of the readers' poll from ST10. Yay! 25 years ago a schoolfriend of mine committed an act of great moral turpitude on a crazy golf course in Whitley Bay. It was all very sordid, and proved to have consequences of almost Hardyesque grimness. The novelty puttery in question was owned by a sinister cult, the Oscillating Brethren of Minsk. They put my pal in a granite cell where he was held incommunicado and forced to subsist entirely on moistened string shoved through the keyhole. Fortunately, due to a clerical error by a work experience girl, my old friend escaped a few weeks ago. Naturally, it's taking him some time to readjust to normal(?) society. Especially difficult, he felt, was catching up with popular culture. Before his incarceration he had, like me, been a great fan of sci-fi and horror. But how could he catch up with 25 years worth of TV shows and films? Where to start? X-Files or Buffy? Firefly or Stargate: Atlantis? Okay, that last one's a no-brainer, as they say, but you get my drift. Fortunately, I had a quick solution for my bewildered buddy. I told him that the BBC, in its capacity as a public service broadcaster, had produced a drama-documentary that embodied every idea ever used in horror and sci-fi since about 1980. Here's a sneaky preview of the cover of ST11. It's all a bit provisional at the moment, but I think it's okay. The format is returning to the original, twice-yearly issues, hence the reference to spring. I was wrong to switch to an annual format, and I'm truly sorry. 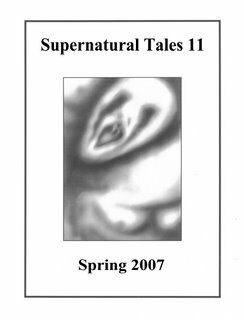 At the moment Supernatural Tales 11 is under way, on the stocks, preparing for launch, building towards a climax... Well, I've done a bit of work on it, anyway. If I can figure out how to do pictures I should be able to put the cover up by way of a sneak preview. It's by Allison Lovelock, the artist who did the very popular owl cover. And the contents are rather spiffy, too. As well as stories there'll be reviews and some mini-quizzes. I like quizzes! I won a skull-shaped bog brush at one in York recently, for I am knowledgeable in the way of spooky stories. I thought I'd include a quiz to challenge anyone who finds or stumbles upon this site. 1. In 'At the Mountains of Madness', what are the names of the polar explorers' ships? 2. Which Lovecraft character was played on screen by Vincent Price? 3. Which HPL story features an ill-fated U-boat? 4. In which HPL story does the immortal phrase 'Glub Glub' appear? As for the answers, well, I'll see if anybody tries it first, then post 'em up in a week or so. hello, hello, who's your spooky friend? This is my very own blog. Gosh. 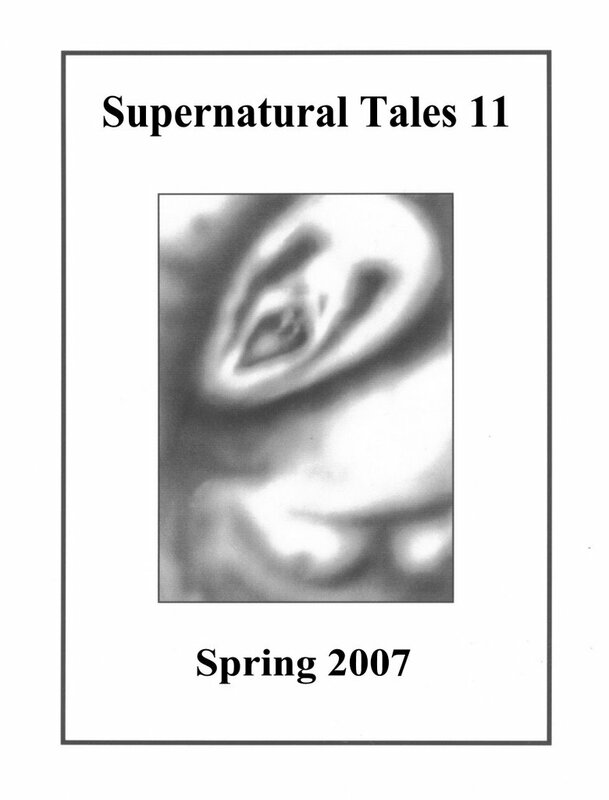 I thought some of the readers of Supernatural Tales, my thrilling magazine, might like to know what I get up to. The life of an amateur editor is fascinating. Sometimes I have tea and biscuits. Sometimes I have an existential crisis. Sometimes I actually do some editing, gordelpus. So, in the weeks and centuries to come I will try to reveal, with shocking frankness, just about everything I'm up to. Within reason. Obviously.